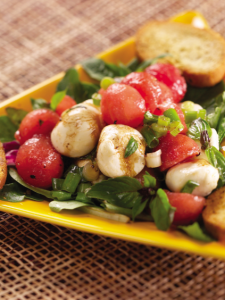 RECIPE: FRESH MOZZARELLA SALAD - What About Watermelon? Now that the school year is back in full swing, I’m reminded of two things: 1) how quickly time flies and 2) how much I love simple recipes. While those don’t seem immediately related, trust me, they are. As the father of a four-year-old, spare time is incredibly valuable when you realize that you have absolutely none of it. From the second I get home until the moment my head hits the pillow, I’m in full-on Daddy Mode. I mentioned that I love simple recipes because they exist to create a great meal for people who don’t want to sacrifice time, taste or nutrition. This week, I’m whipping up this awesome recipe for Fresh Mozzarella Salad. Will my daughter like it? Maybe, but if she doesn’t, that just means there’s more for me! Toss together the watermelon, mozzarella, basil, scallions and oil. Season with salt and pepper to taste. Serve over a bed of baby greens, with crostini on the sides. Drizzle a bit of balsamic vinegar if desired.